National Honey Bee Awareness Day was last week, but I didn't get around to calling attention to it 'til just now. Many of us simply don't know how much of an impact honey bees have on our lives, specifically the food we eat. They pollinate as much as 1/3 of everything we eat. Think about that! 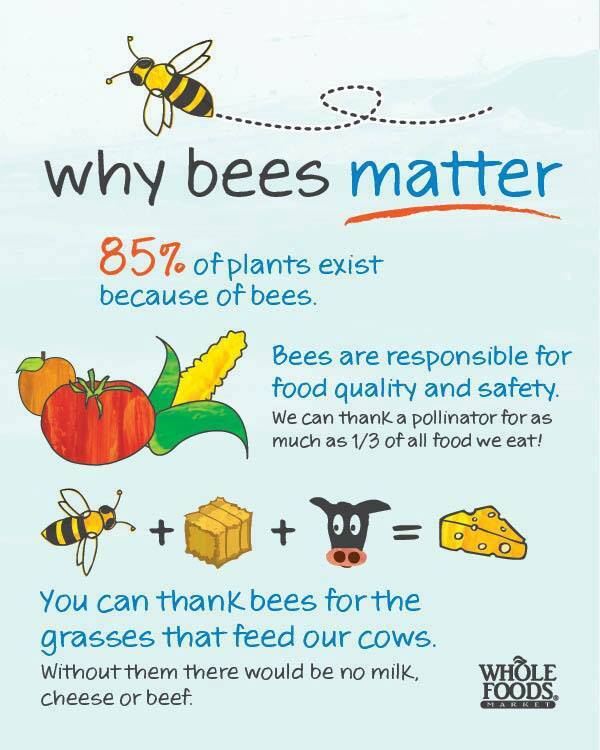 If we didn't have bees, we wouldn't have fruit and vegetables, or even dairy products since cows eat grass. If you golf, you've probably asked yourself, "Do I really need a cover for my putter?" It's an interesting debate. Some golfers think it's a hassle to take it on and off every hole, while others are sticklers for preserving the quality of the face no matter what. I'm somewhere in the middle - I keep a cover on my putter when my bag is in storage or in transit, but once I'm on the course I tuck the cover into a pocket in my bag. Ace of Clubs Golf can probably sway you to own a cover! They have head covers that will tempt you no matter which side of the debate you're on. And they are nice. Tuck your club into the comfy leather womb and rest assured that baby's safe. I recently got my hands on the lime lizard putter head cover. The actual color is pretty true to the image you see. It's a nice, bright green. The cover features the look and feel of luxurious lizard leather, and as you can tell, it's designed to fit the anser and blade style putters. A little more about Ace of Clubs Golf... they use only premium cowhide leather as the base for every product. The leather undergoes a finishing process to replicate the to look and feel of exotic animal leathers (such as ostrich and alligator). But don't worry, no threatened or endangered species are ever used during the manufacturing process. If you're like me then your eyes light up when in the presence of bright, cool things. 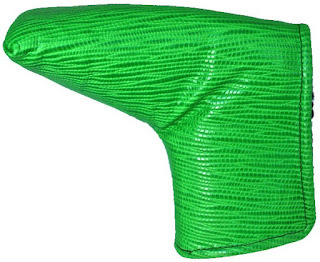 I love color, and I love the selection of putter head covers on the site. There are plenty of colors and a variety of leather designs as well. There are even a few Seattle-themed covers as Ace of Clubs is headquartered in Seattle, Washington. If the guys at Ace are reading this, sorry about the Patriots ruining what could have been a Super Bowl win! I thought the game was over, but Malcolm Butler had other ideas. Ace of Clubs also has plenty of other cool stuff in the shop like belts and grips, so check it out. 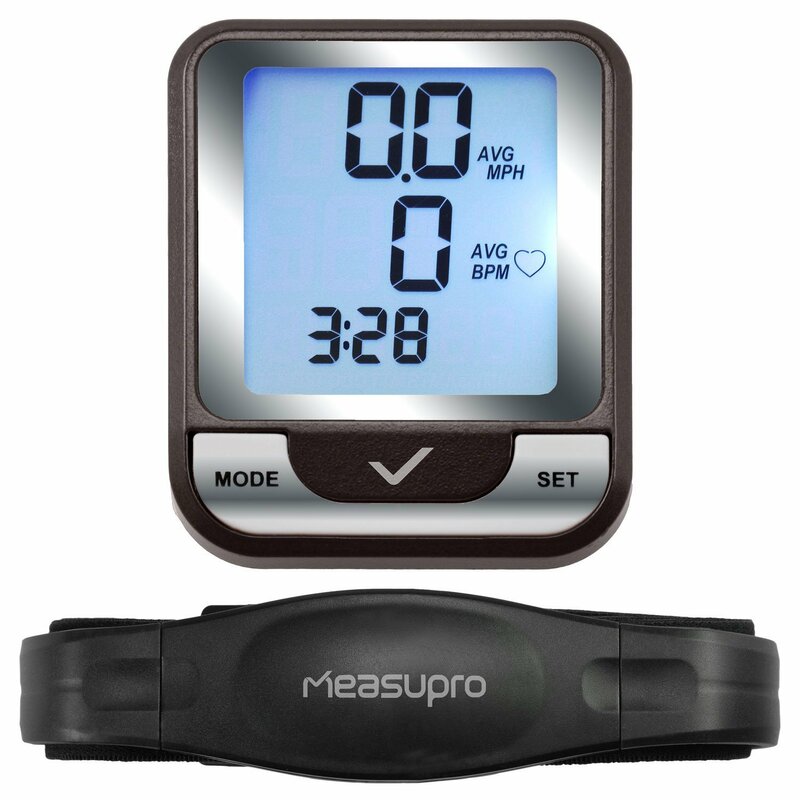 I recently won a MeasuPro wireless bicycle computer and I've decided to turn around and give it away to a lucky Giveaway Guy reader rather than keep it for myself. You might remember that I reviewed and hosted a giveaway for this computer back in June. As luck would have it, now I've got another one. The giveaway is available to everyone worldwide. Last month I partnered with HomeRight for a paint sprayer giveaway and it was a success! 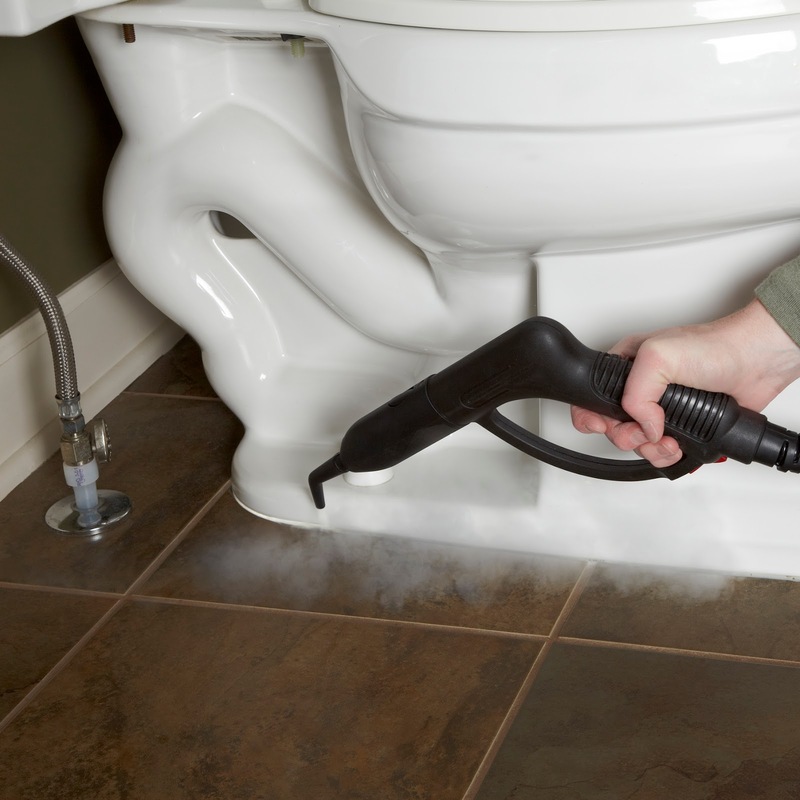 For this reason, we're doing it again, but this time for a steam cleaner. If you came by my blog last month, you may already know that DIY projects are HomeRight's focus. They’re confident their products and tools can help make your project easier, faster, and neater. 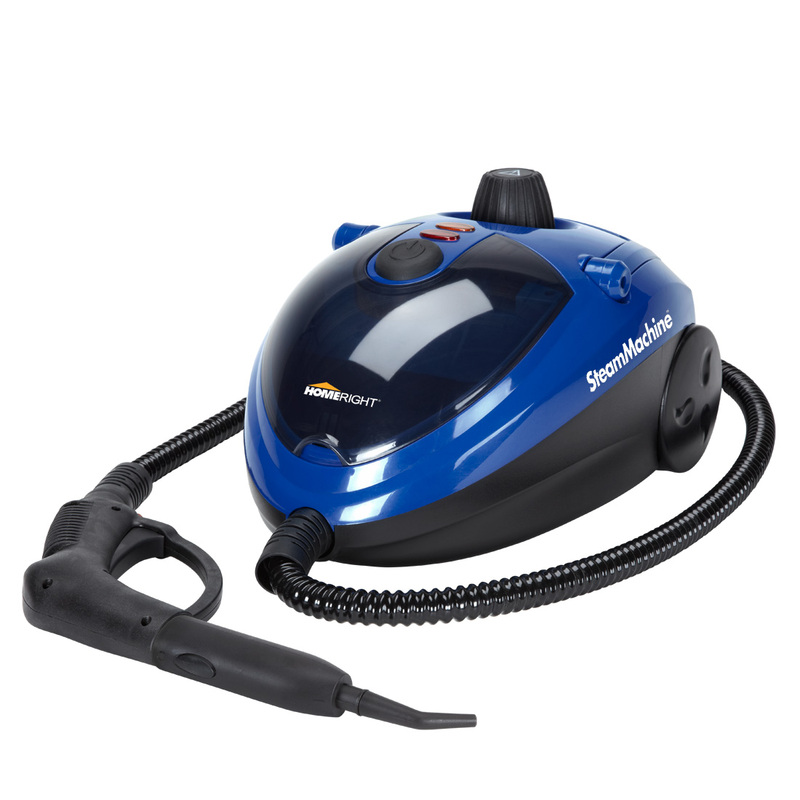 HomeRight's SteamMachine Power Steamer is the easiest way to remove wallpaper and disinfect hard floor surfaces. This steamer uses pressurized, high temperature, steam to loosen and dissolve dirt, grease, grime, and kill bacteria. "So show me," you say? That's coming. While it may look like something the pros use, anyone can get the hang of this. If I can, then so can you. Just fill the reservoir with water and it'll be ready to use in a couple minutes. It's easy and the results looks great! You can take care of a lot of stuff with this power steamer. Aside from floors and walls, try attacking your kitchen counter top, stove top, and bathroom fixtures. Personally, I feel the bathroom has the most germs, so rather than a sponge or scrub brush for the floor, I reach for the SteamMachine. Now that I have a house of my own as of two weeks ago, no grime is safe! So who wants to win one of these?! The folks at HomeRight have been gracious enough to offer up a SteamMachine Power Steamer to one lucky Giveaway Guy reader. Ever seen a golf ball with custom text or numbers on it? Well there are plenty of ways to get your hands on those, and Frederick Engraving is a good place to start! I've given personalized balls as gifts to people in the past and it's usually a pleaser. Even balls with their own face on it! 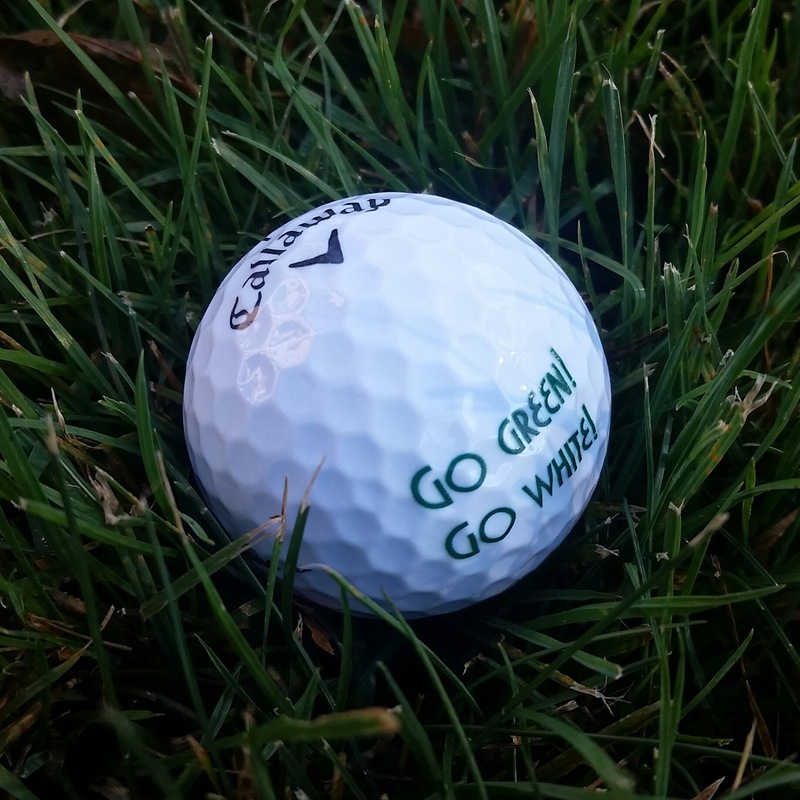 With custom-printed balls you have more of a feeling that it's yours. Just don't lose 'em now. I recently got my hands on some awesome Callaway golf balls from Frederick Engraving on Etsy. The set of three comes in a manufactured Callaway Warbird box, ready for you to wrap as a gift or just save for yourself. "Go green! Go white!" is Michigan State thing. You get up to four lines of text on the ball, each line with a max of 10 characters. At checkout, in the "note to FrederickEngraving" area, put the text exactly as you would like to appear. My wife is a Michigan State alum and I ordered these for her. "Go Green! Go White!" is one of the cheers and you can see how it's printed in the photo above. Nice, huh? I'm really happy with the way it turned out and my wife thinks it's cute too. 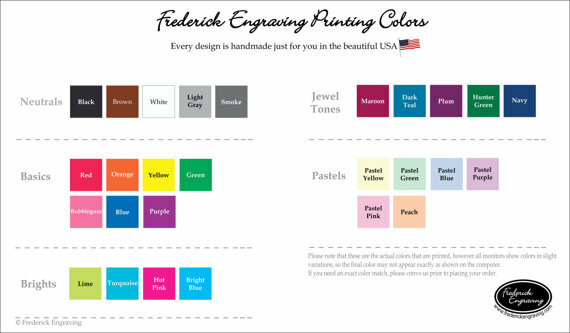 Frederick Engraving has plenty of other cool stuff in the shop for custom printing, so check it out. 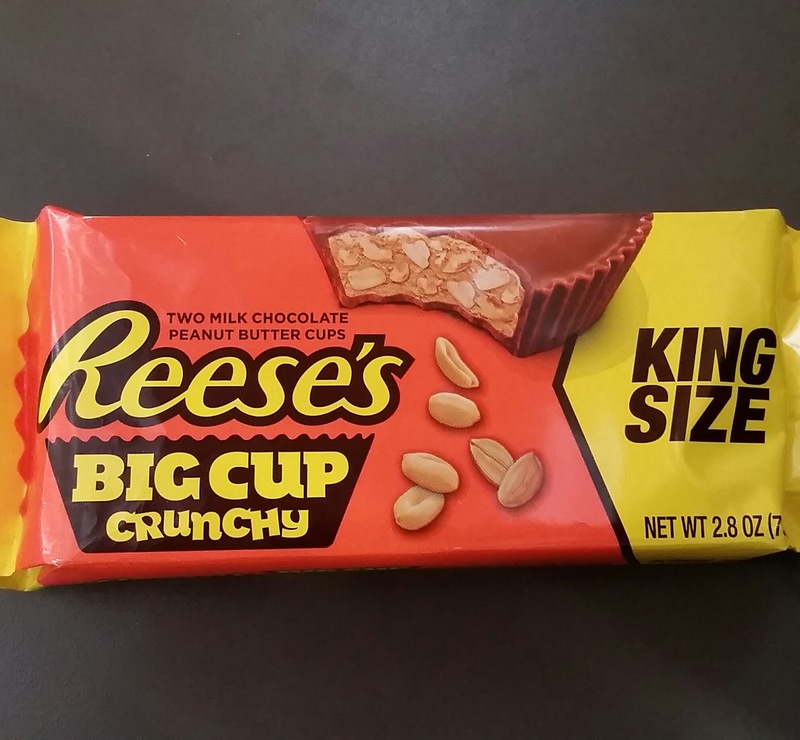 Today at all Tedeschi Food Shop locations they had a promotion for a free Reese's Big Cup Crunchy, no catch. All you had to do was either bring in the flyer or simply ask about the candy. 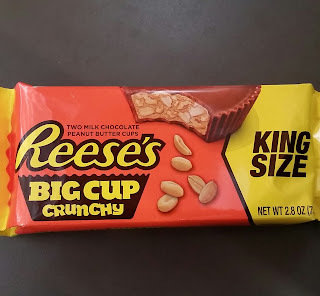 With the help of some willing friends, I've gathered up five (5) packages of Reese's Big Cup Crunchy, and they're king size too! Rather than hoard them for myself, I'm giving them away to a lucky Giveaway Guy reader. The giveaway is available to everyone worldwide. I came across this graphic which had went somewhat viral on Facebook and found its way into my news feed. I don't follow politics much, but when I saw this I had the urge to share. Check out the top donors for Hillary Clinton - mostly banks and corporations. 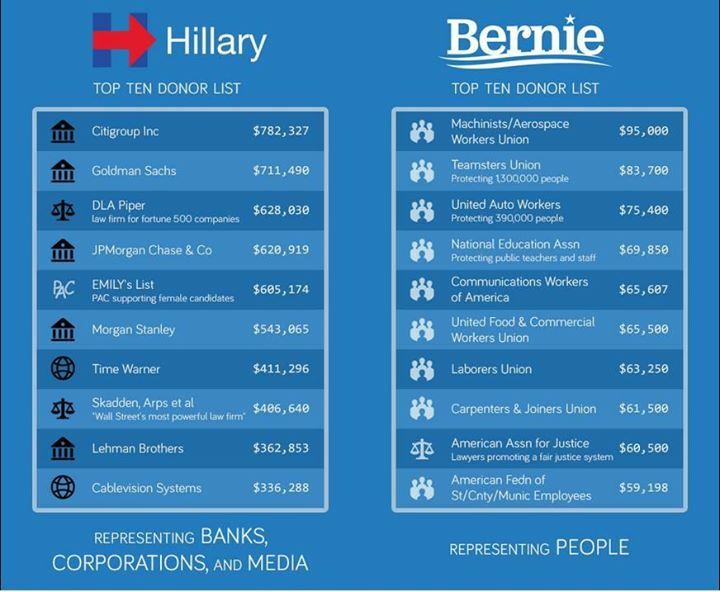 Then look at Bernie Sanders' donors - he's represented mostly by unions and PEOPLE. Fat Cat Bake Shop is back! Previously we did a giveaway for brown rice treats and it was awesome. Visitors to my blog loved it, so we're doing another giveaway, but this time for truffles! Eating vegan once in a while is fun and great for the body. I like to treat myself to vegan desserts and you should too! There are many physical benefits of vegan foods, including weight loss, increased energy, and healthy skin, just to new a few. I recently tried some delicious vegan truffles from Monica at her Etsy shop, Fat Cat Bake Shop. As she states on her profile, she's at peace while employing her hands, creating and baking some of the best damn treats you'll ever have, whether you're vegan or not. Hemp seeds have anti-inflammatory properties and are packed with Omegas. Hazelnuts have manganese and copper, and Monica says they're one of the best accompaniments to chocolate. Nuts and chocolate are obviously great together, so I would agree with her! 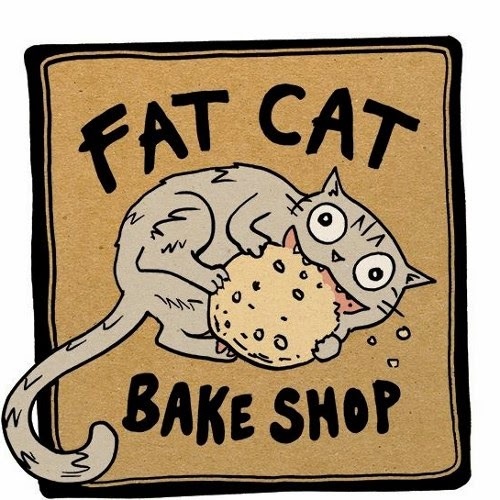 Fat Cat Bake Shop uses 100% vegan ingredients and does NOT use any genetically modified ingredients. Fat Cat Bake Shop uses organic items when available. There are plenty of other cool stuff in her shop, so check it out. So who wants to win some truffles?! 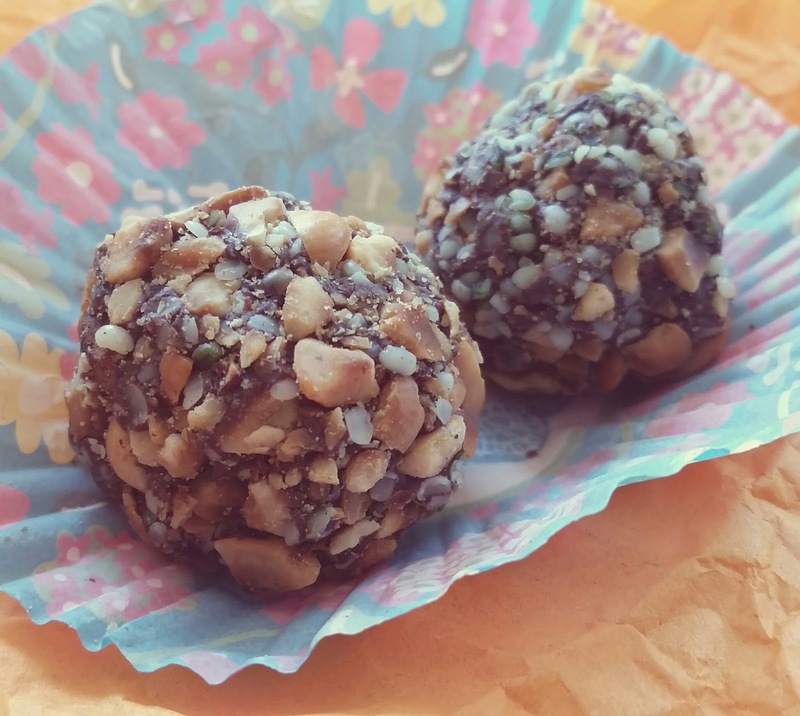 Monica is graciously offering a pack of 4 decadent and healthful hazelnut & hemp truffles to one lucky Giveaway Guy reader. If you're like me, you love practical giveaways! Pillows are one of those things you don't think about, but our neck and heads deserve support and comfort. Chances are your pillow has lost it's shape and needs to be replaced. Why not replace your pillow with one from Mediflow? I recently had the pleasure of getting my hands on the original waterbase pillow, clinically shown to improve the quality of your sleep. 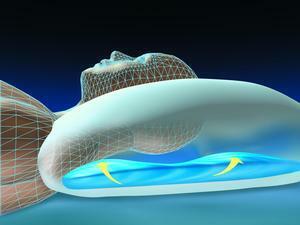 Rest assured that Mediflow can help improve quality of sleep unlike any other pillow on the market. Rest assured, was that a pun? You can easily add water to the bladder and adjust the support level to get the comfort level that's right for you. It's pretty cool, but does not have the sloshing effect that a waterbed does thankfully. Whether you prefer soft, medium, or firm comfort, customize to your liking. It's unlike any other pillow I've tried. I came across an interesting Mediflow tweet that my wife and I analyzed together. I'm a combination of C and D, which actually aligns with my personality - suspicious and reserved. What does your sleep position say about you? So who wants a pillow?! 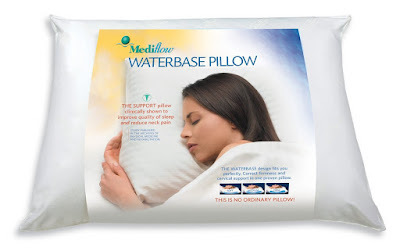 The folks at Mediflow have been gracious enough to offer up a waterbase pillow to one lucky Giveaway Guy reader. I've had a few giveaways tailored for pets lately, and I can see you guys enjoy 'em so I'm continuing with the pet trend. 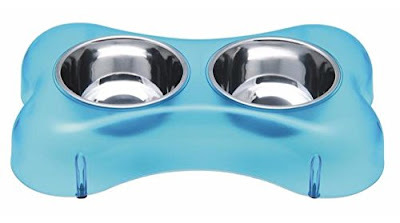 This time I've partnered with Propel Communications and Loving Pets to bring you a cool double diner set. Propel is a PR (public relations) firm, offering personalized services to any size company, and Loving Pets is one of their clients. 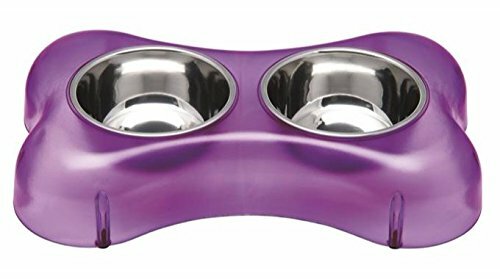 Loving Pets is proudly America’s best-selling stainless steel pet feeding bowls! They continue to provide innovation, quality, and affordability in stylish and functional options. The way I see it, their products fit just about any home décor. Loving Pets products support a healthy lifestyle for your pet, and they also educate pet owners to do the same. If you check 'em out on Facebook or Twitter you'll see they do just that. Loving Pets also proudly supports the global pet community by donating to pet shelters, rescues, and causes. They're awesome! I recently had the pleasure of getting my hands (or should I say paws) on the Osso Diner bowl set, which is available in two different sizes - pint and quart. Pint size is ideal for cats or small dogs, and quart size is better for average size dogs. It also comes in two colors. I've got the one in blue and I dig it. Was that another pets pun? Anyhow, the other color is purple. It's shaped like a bone. My wife finds it cute. The double diner includes stainless steel bowls which can be removed and cleaned. It's durable and adds some style to the dining area. So who wants an Osso Diner set?! The folks at Propel and Loving Pets have been gracious enough to offer a diner in the size (pint or quart) and color (blue or purple) of your choice to one lucky Giveaway Guy reader. This giveaway is open to users in the continental U.S. only (Alaska & Hawaii not eligible). One winner will be randomly selected via Rafflecopter, which I will contact by email after entries are verified. The winner will have 24 hours to respond, otherwise a new winner will be selected. Recently I stumbled upon an interesting post on the Slice of MIT Blog. Apparently students at MIT must pass a swim test in order to graduate. Interesting, huh? To meet MIT’s General Institute Requirements, many students attending first-year orientation will hop in the pool for a swim test, a 100-yard swim with no time requirement. I've heard the reason for the 100-yard distance is because the nearby Charles River is 200 yards across, so a person would only need to swim at most half that distance to reach the shore. You might be thinking, "So why does MIT have a swim test?" Last month I partnered with Illumiseen for an LED dog collar giveaway and it was a success! People love giveaways for their pets. And for this reason, we're doing it again, but this time for a dog leash. If you came by my blog last month, you may already know that IIllumiseen sells innovative LED-based products. These products are aimed to deliver safety and value to people and animals. 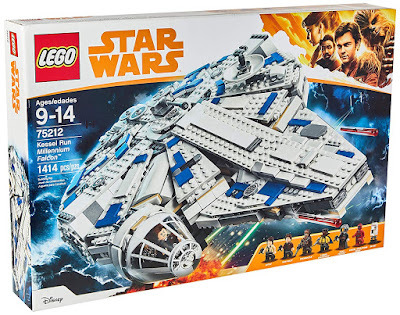 Illumiseen has a store in the Amazon marketplace where you can check out their products, and they ensure every effort is made to exceed customer expectations. I recently had the pleasure of getting my hands (or should I say paws) on the LED dog leash, perfect for evening strolls with the pup. I've got the one in yellow and I dig it. Was that another dog pun? 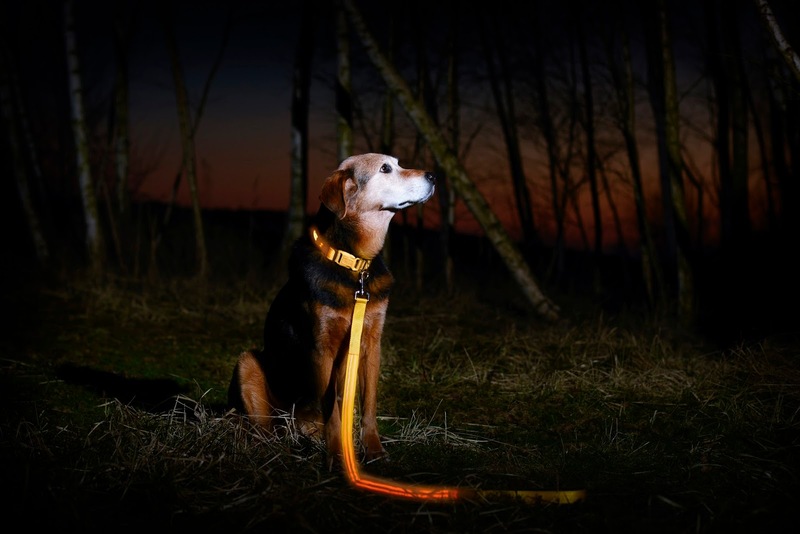 Anyhow, rest assured that using the Illumiseen leash will help keep you and your dog safe. It's weather resistant with a comfortable soft grip handle, although I'd probably advise getting it too wet. It's resistant to water, but not waterproof, so keep that in mind and take care of the leash just like you would anything else in the rain. 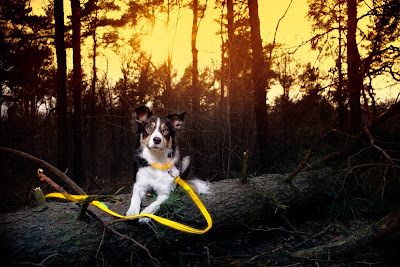 When turned on, this leash is bright! It's impossible to not be seen by cars or whoever else. They'll see you and the dog coming for sure. Not only is it great for taking the dog out, but you could strap the leash to a backpack for biking or something like that. Oh, and it has a blinking mode too. Again, impossible to not be seen. The leash is available in six colors. Which one do you like? Illumiseen also offers a collar, so you can mix and match colors too. I've got the collar in yellow and I dig that my collar and leash match. Something I'm thankful for with this leash is that it doesn't use batteries to light up the LED. It's USB rechargeable! I can even plug it into my lap top and it charges in just an hour or two. A charge will give you about 10 hours of illumination, which is a lot longer than you'd think. So who wants a leash?! The folks at Illumiseen have been gracious enough to offer up an LED dog leash in the color of your choice to one lucky Giveaway Guy reader.